In 1934, the Bishop of Melbourne, Australia invited Columban founder Bishop Edward J. Galvin to attend the the National Eucharistic Congress, which was scheduled for early December 1934. By this time, the Columban Fathers in China were closing in on a decade and a half of mission work in China. They had achieved much success, but the growth of their missions necessitated more funds and personnel. Bishop Galvin saw a chance to promote the Society in the Columban “homeland” nations of Ireland and the U.S.A. Bishop Galvin left China in late 1934 and attended the National Eucharistic Congress in Melbourne. 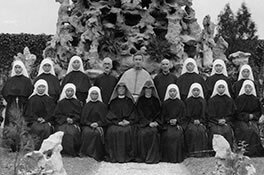 After stopping to visit the Columban mission in the Philippines, in early 1935 Bishop Galvin arrived in the United States. He traveled all across the nation, meeting with benefactors, raising funds, and tirelessly promoting the Society that he had founded. Bishop Galvin celebrated Saint Patrick’s Day in San Francisco, gave a speech in Denver, and checked on the Columban staff and students in Omaha. In late April Bishop Galvin went to Kentucky to thank and congratulate the Sisters of Loretto for their work with the Columban Fathers in China. Other stops included Minnesota and Brooklyn, where he had worked before founding the Columbans. By December 1934 the Columban founder was back in Ireland, his nation of birth, visiting old friends and promoting the Society. Bishop Galvin’s pace on this trip was so frenetic that some Columbans worried about his health. Bishop Galvin finally did return to his post in China in mid-June. His whirlwind trip to the U.S.A. and Ireland in 1934 had greatly benefited the Columbans and ensured their future success.